Basic Precious Metal Clay (PMC) class with Guest instructor Barbara Hance. Curious about Metal Clay? 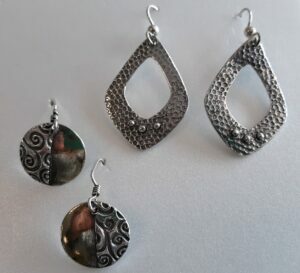 This class is designed to offer basic instruction in metal clay techniques. Roll, cut and texture your own unique earings. Your pieces will be kiln fired during your lunch break. Tumble for a high shine and add a patina, if desired. A perfect opportunity to get your hands into this medium, and have fun creating your one-of-a-kind jewelry piece! Class time will allow you to make two pairs of earrings. Class fee $125 (includes clay). All tools will be provided. Class starts promptly at 10am and runs to about 2:00pm. You are welcome to bring lunch/snack/beverages. Class size is limited. Please call to register, $40 deposit is required.